This one was heard by the first time the 29’th of august 1976 on 6202.5 kHz. The power was announced as 75 watts. In the beginning they was probably relayed by Radio Poseidon International. 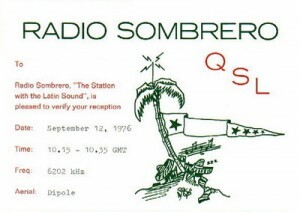 The slogan was very closed to Rainbow’s; “The station with Latin sound”. The last time they was heard was the 31’st of July 1977. Probably because of that FRL has closed down.